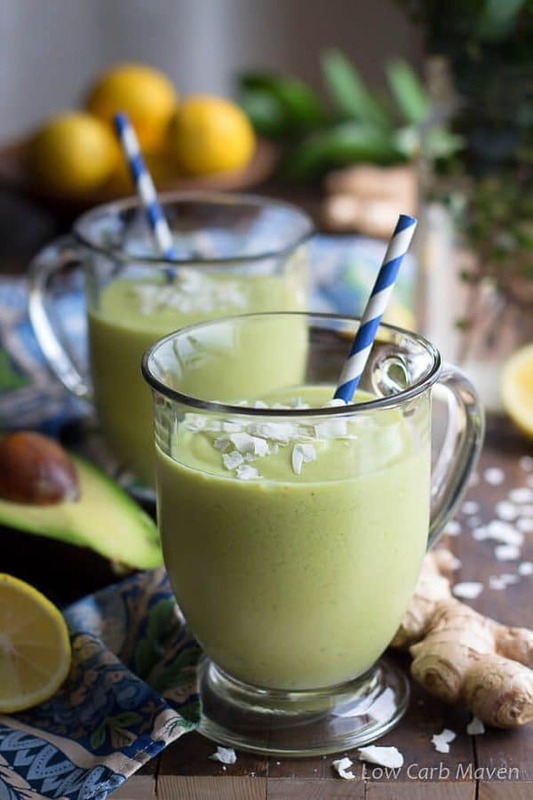 A rich creamy keto avocado smoothie made with ginger and turmeric. This detox smoothie is high in antioxidants and anti-inflammatory compounds. Sugar free and high in good fats, it’s perfect for those on a healthy low carb keto diet. Paleo, Whole 30, Dairy Free. 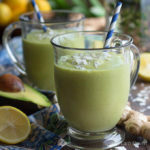 A rich creamy keto avocado smoothie made with ginger and turmeric. Smoothies are very popular breakfast options. Every day I see beautiful smoothie bowls on Instagram and Pinterest. Not only are they gorgeous eye candy but they might as well BE candy to those on a controlled carbohydrate diet. This healthy low carb coconut milk avocado smoothie is low in sugar and tastes great – thanks to my friend the avocado. When choosing ingredients for this delicious avocado smoothie, I considered both taste and health. My goal was to prepare a smoothie that contains healthy fats, vitamins and minerals, and soothing compounds for the stomach. Anti-oxidative and anti-inflammatory compounds for the body were also a must. All of this in a creamy drink that tastes mildly of coconut, ginger, and turmeric. Avocados are currently on trend in the food blogging world and with good reason. Not only are they delicious, they are packed with nutrition. Avocados contain heart-healthy monounsaturated fat, vitamin K, magnesium, and potassium. In fact, avocados contain more potassium per ounce than bananas (136 mg vs 100 mg) and much less sugar (.2 g vs 3.4 g). It’s no wonder they are the darlings of low carb keto dieters everywhere. This detox smoothie is high in antioxidants and anti-inflammatory compounds. If you enjoy this ingredient combination try the keto avocado smoothie with cilantro and mint (recipe coming soon). It’s soothing and refreshing. Coconut Milk Avocado Smoothie with ginger and turmeric is 4 net carbs per serving. 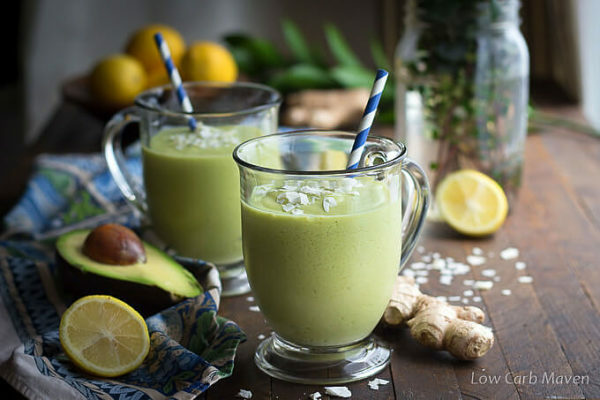 A rich creamy low carb coconut milk avocado smoothie made with detox ingredients like ginger and turmeric, both high in antioxidants and anti-inflammatory compounds. Sugar free and high in good fats, it’s perfect for those on a healthy low carb keto diet. Add the first 6 ingredients to a blender and blend on low-speed until smooth. Add crushed ice and sweetener. Blend on high until smooth. Taste and adjust sweetness and tartness per your taste buds. Makes 2 avocado smoothies. Nutritional information per 1 smoothie. NOTE: Adding a pinch of black pepper will make the curcumin in the turmeric more bioavailable and doesn't impact the taste. Silly question. Can this be made ahead of time and stored in the fridge? If so for how many days? Thanks! Popsicles is an awesome idea. I will certainly try this!! Thank you for the quick reply. Adding just a pinch of black pepper to this would make the curcumin in the turmeric 2000% more bioavialble. This adds a neglgible effect to the taste while boosting the nutrients value by a big margin. This smoothie was really creamy, and nice tasting too. A strong ginger taste though, maybe I used too much. But I liked it very much. I left out the ice and I used one packet of stevia as my sweetener. Nice minty green rich colour. I made this recipe for breakfast – So yummy! I added extra ginger for a ‘kick’ and I used a bit of cinnamon instead of artificial sweetener. I also threw in a handful of spinach. I’m trying to get over a cold and get extra veggies in my diet to help. Does it keep well in the fridge for 1-2 days?? I’m excited to try this over the weekend, thanks for sharing this recipe! Do you use fresh turmeric root or the powdered spice in this recipe? I know fresh ginger root makes such a difference so I wasn’t sure what you recommended for the turmeric. For those dogging her about the sugar fee sweetener, she never said artificial sweetener. Stevia can be used and is a natural alternative to sugar. Excellent. I used water instead of coconut milk and almond milk and replaced the turmeric with Ceylon Cinnamon. Turmeric is an active oxilate that can damage your liver if taken too much. Did not want to use a sugar free sweetener because even that spikes insulin apparently. So what to use is the question. Avocado tastes better with something sweet, but for Keto I cannot do anything sweet. Darn it. But thanks for the recipe. This is quite nice. Maybe I do have to use coconut milk. This look fantastic but I fail ti understand why you would put artificial sweeteners into healthy drink? To The recipe should include either no sweetners or raw organic honey which has it’s own health benefits. Hi Margot. I absolutely understand your point of view regarding using honey. Since this is a low carb website that keeps diabetics in mind with it’s recipes, you wont find honey or any other “real” sugars in the recipes as they spike blood sugar – which poses dangers for diabetics. Instead, those who follow a low carb or keto diet often use erythritol (a natural sugar alternative that is safe for diabetics), xylitol (a natural sugar alcohol found in birch sap, that can spike some diabetics), stevia, or erythritol blends with stevia, monk fruit or oligosaccharides. It was delicious. I didn’t use the ice, but still very good. I make pineapple mango avocado aloe vera fresh ginger turmeric flax seed granola coconut water with a splash of almond milk. I do those three times a day. When I say these smoothies are the greatest. This was great. I do AIP so I modified it because the sugar free sweeteners are a no go on the Autoimmune Protocol diet. Honey or a couple of dates would be a good substitute. I loved this creamy smoothie! I don’t have fresh ginger on hand so I used organic ground instead. Definitely going to try fresh next. Can this be used as meal replacement smoothie? good day.. is all the calories is for 1 serving? This looks really good, Kim! I’ve been buying the small avocados, cutting them into quarters and freezing them individually. Makes for a really good shake or smoothie that’s creamier than with ice alone. This recipe served as a great base for an avocado smoothie! I didn’t have fresh ginger on hand, so used 1/2 t. ground organic ginger, 1/2 t. turmeric, 1 T. Pyure organic stevia blend, 1 whole avocado, almond milk and crushed ice. Surprisingly refreshing! It has the consistency of soft serve ice cream and a unique flavor profile. The ingredients were chosen based on what I had on hand today, of course. I would increase the stevia and turmeric, and probably bumped up the ginger next time, too. Definitely would make this again.